People spent the twentieth century obsessed with the future. We created technologies that would help connect us faster, gather news, map the planet, and compile knowledge. We strove for an instantaneous network where time and space could be compressed. Well, the future's arrived. We live in a continuous now enabled by Twitter, email, and a so-called real-time technological shift. Yet this "now" is an elusive goal that we can never quite reach. 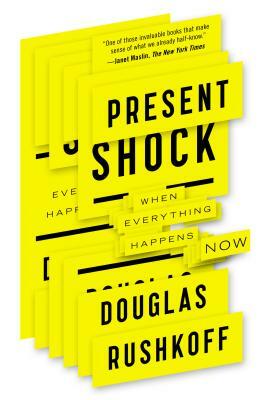 And the dissonance between our digital selves and our analog bodies has thrown us into a new state of anxiety: present shock. Douglas Ruskoff's previous books, including Cyberia and Media Virus, have been translated into thirteen languages. He is the Technology and Culture Consultant to the United Nations Commission on World Culture and a regular consultant to Fortune 500 companies, and he writes a bi-weekly column for the New York Times syndicate. He teaches at the Esalen Institute and Banff Center for the Arts, and will be adjunct professor of Media Sociology at New York University in 1999. He lives in New York City.